I love quinoa and the bouncy texture it has against your teeth. All the flavours here are distinctive, fresh and summery. The seedlings add colour but also deepen the radish flavour. Put the quinoa in a sieve and rinse well. Transfer to a medium saucepan and add 600ml water. Bring to the boil and simmer over a moderate heat for 8–10 minutes until the germ separates and most of the water has been absorbed. Drain the quinoa and rinse under cold water. Leave in the sieve to dry. Put the beans in a saucepan full of boiling water. Bring back to a simmer and drain at once into a colander. Refresh under cold water and leave to dry a little. Now press gently on each bean to remove the skins and reveal the bright green centre. Discard the skins. Take the lemons and use a small, sharp knife to slice off each end. Place on a chopping board and cut down the side of each lemon, following its natural lines, to remove the skin and white pith. Over a large bowl, cut between the membranes to remove the individual segments. Put these in the bowl and squeeze in any juices. Peel, stone and slice the avocados thinly, then add to the bowl. Toss the slices in the lemon juice. 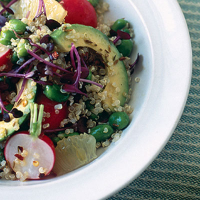 Once the quinoa is dry, add it to the bowl. Add the broad beans, garlic, radish, half the basil seedlings, cumin, olive oil and chilli. Toss gently, taste and season, then scatter over the remaining basil seedlings. Marlborough riesling has all the zing you need to set off a salad, but combines this with a power and depth that can match avocado, chilli, cumin, radish and lemon.